The global mobile money market is on the cusp of a transformative change with growth increasingly swinging toward emerging economies, says TMR in a new report. The global mobile money market will derive growth from factors such as companies investing in context-based marketing and real-time marketing to leverage mobile money. With smartphone and personal device sales spiraling in emerging countries with an increasingly affluent consumer base, the need for more inclusive banking is also simultaneously being felt. This presents a multi-billion dollar opportunity for companies such as Bango.net Limited, Fortumo OÜ, Paypal, Inc. (PayPal Holdings, Inc.), Judo Payments, and others. Mobile commerce, mobile banking, mobile wallets, and mobile payments all come under the purview of the mobile money market. The coming together of various conducive factors will create an opportunity-laden environment for providers of mobile money services. Currently, service providers are focusing on cost effective alternatives to reach out to a larger consumer base. However, consumers continue to remain wary about security and privacy; the situation is compounded by regulatory complexity hampering the long-term growth of the mobile money market. The current generation of disparate platforms is also hindering the adoption of the mobile money solution amongst consumers as they are required to manage multiple wallets for different transactions/services. However, there is little doubt that with the unprecedented penetration of mobile devices, these will increasingly serve as vehicles for financial transactions. 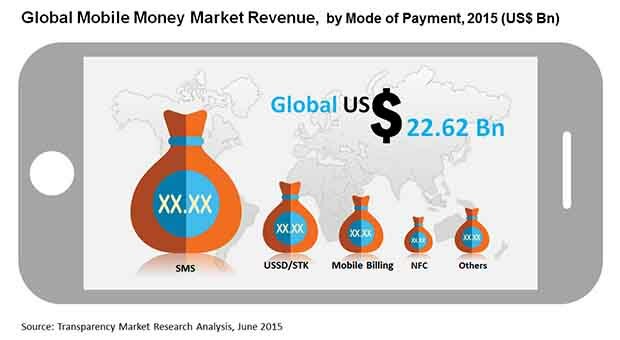 In the global mobile money market, by mode of payment, the SMS payment segment holds the largest share. This is attributable to the convenience and efficiency that SMS-based payment operations lend. The greatest advantage, however, is that SMS-based mobile money is compatible with different connected devices such as tablets and smartphones. In countries across MEA, APAC, and Europe, transactional payments by SMS are already popular and there are no signs of their popularity fading through the forecasting horizon. However, the market is also marked by a growing adoption of other payment methods such as mobile billing, payment clients, and WAP-based payments. The future could see NFC and UUSD/STK modes emerge in a big way to challenge the leading position of SMS payments. Moreover, by type of purchase transaction, in 2014, the money transfers and payments segment was the largest in the global mobile money market. Growth is projected to be the strongest in the airtime transfers and top-ups segment through 2024. In 2015, sectors such as BFSI, energy and hospitality collectively accounted for more than one-third of the revenue generated in the mobile money market. Geographically, the mobile money market saw the highest revenue coming in from Europe in 2015. While North America trailed Europe in terms of revenue contribution, the region is expected to post better growth as compared to Europe through the forecast period. Collectively, the two regions are estimated to contribute more than fifty percent of the revenue to the global mobile money market. The MEA region is anticipated to be the fastest-growing segment during the forecast period due to rising Internet and tablet penetration and technological advancements in the telecommunication sector. Real-time buying is gaining momentum in MEA, which enables companies to develop targeted products and services on the basis of mobile usage patterns. This is expected to create immense opportunities for the mobile money market in the region. Among the top service providers in the global mobile money market are: Bango.net Limited, Boku, Inc., Dwolla, Inc., Fortumo OÜ, Judo Payments, Paypal, Inc. (PayPal Holdings, Inc.), Square, Inc., Stripe, and WePay, Inc. The mobile money market report provides an analysis of the global mobile money market for the period 2014 – 2024, wherein 2015 is the base year and the period from 2016 to 2024 is the forecast period. Data for 2014 has been included as historical information. The report covers all the prevalent trends playing a major role in the growth of the mobile money market over the forecast period. It also highlights various drivers, restraints, and opportunities expected to influence the market’s growth during the said period. The study provides a holistic perspective on market growth throughout the above forecast period in terms of revenue estimates (in US$ Bn), across different geographies, which include North America, Europe, Asia Pacific (APAC), Middle East & Africa (MEA), and Latin America (LATAM). The report provides cross-sectional analysis of the global mobile money market in terms of market estimates and forecasts for all the segments across different geographic regions as well as on the basis of mode of payment, types of purchase, industry verticals, and select countries across each region. The report also includes competitive profiling of major players, their growth strategies, their market positioning, and their various recent developments. This report also provides market positioning analysis of key players operating in the mobile money market. The report offers an in-depth analysis of the market’s drivers, restraints, and growth opportunities during the forecast period from 2016 to 2024. Impact of these factors over short, medium and long term is also provides for global and regional markets. The report includes comprehensive coverage of the underlying economic and technological factors under the key trends analysis section. Based on the industry verticals, the mobile money market is segmented into BFSI, energy and utility, retail, health care, supply chain and logistics, hospitality and tourism, media and entertainment, telecommunication and IT, and others. Based on factors such as privacy and security, customized requirement, flexibility in payment options, and relevant customer care support, users select the best-fit mobile money solution in order to cater to their requirements and business usage. The report highlights the key factors contributing to the growth of mobile money across major emerging market such as India, China, South East Asian countries (Indonesia, Malaysia, and Vietnam), Latin American countries, and major African nations such as Kenya, South Africa under the section country snippets and regional mobile money market analysis. Further, to provide insight to nature of transactions carried out by consumers, analysis in terms of mode of payment and type of purchases is also included in the study. Mode of payments considered within the scope are – NFC, Mobile Billing, SMS, and USSD/STK. Different major type of purchases included while estimating the market size are – Airtime Transfers & Top-ups, Money Transfers & Payments, Merchandise and Coupons, and Travel and Ticketing. The report aims to provide a comprehensive analysis of the mobile money market across geographies including North America, Europe, Asia Pacific, Middle East and Africa (MEA), and Latin America. Major challenges faced by the developed countries and key factors contributing to the popularity of mobile money across developing countries are highlighted in the report. The report also offers the contribution of the developed and emerging countries across the world. Under the company profiles section, the report provides an overview of the mobile money service providers operating in the market, the strategies deployed by them to gain competitive advantage, the annual revenue generated by them in the past two or three years, and their recent developments. The companies profiled in this report include Amobee, Inc. Bango.net Limited, Boku, Inc., Dwolla, Inc., Fortumo OÜ, Judo Payments, Paypal, Inc. (PayPal Holdings, Inc.), Square, Inc., Stripe, WePay, Inc.